If you have just been diagnosed with diabetes, you might be wondering if that means you'll have to start taking insulin. The answer depends on the type of diabetes you have and how much your condition has progressed. People with type 1 diabetes require supplemental insulin because their bodies can no longer produce insulin themselves. However, type 2 diabetes is different. Although you may eventually be prescribed insulin with type 2 diabetes, your doctor will most likely start you out on a healthy diet and exercise first to see if this helps. Even if you do end up needing medication and/or insulin, eating right and exercising may help you need less than you would otherwise. Whether or not you will need insulin when you have diabetes type 2 is based on individual circumstances. The first step? Knowing the facts. The difference between type 1 and type 2 diabetes lies in the cause of this condition. Beta cells, found in the pancreas, produce the body’s insulin. In type 1 diabetes, most of those beta cells have been destroyed, limiting the supply of insulin. As a result, individuals with type 1 diabetes must take insulin to control their blood glucose levels. In type 2 diabetes, the pancreas may still produce insulin, but it either produces insufficient amounts or the body resists the insulin itself. Diet, exercise, and various oral medications can help your body use its self-produced insulin more efficiently. Here’s the catch: Type 2 diabetes is a progressive disease, meaning the insulin-producing beta cells deteriorate over time. Eventually, actual insulin therapy may become necessary. Indeed, research is showing increasing evidence that using insulin earlier in type 2 diabetes may help the pancreas continue to make insulin and can improve the disease overall. Based on the goals and structure of your management plan, your healthcare professional may prescribe rapid, short, intermediate, long, or very long-acting insulin. Among these categories, insulin onset can begin as soon as 10 to 15 minutes or as long as six hours after injection and can remain effective for up to 24 hours. Some people who have trouble dosing for themselves use a pre-mixed product of different types of insulin. Different delivery options are also available. 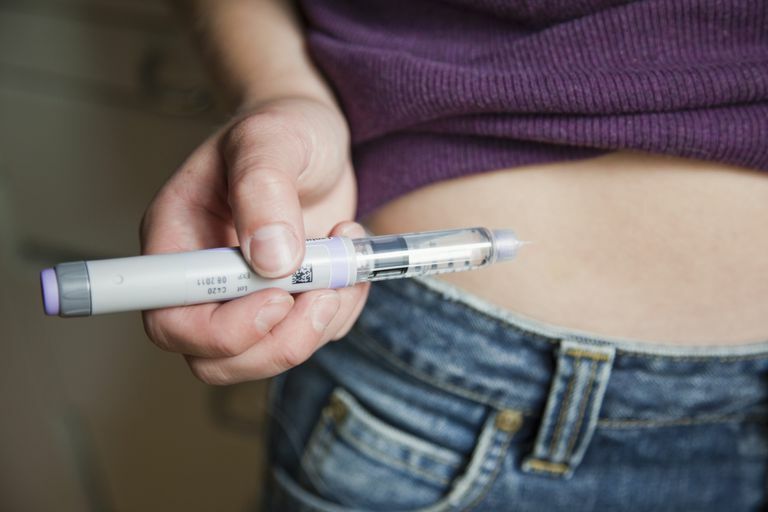 Traditional insulin therapy uses injections, either via syringes or insulin pens. These pens can be easier to use than syringes and look very much like writing pens. Frequency and dosing depend on your glucose levels and the type of insulin you've been prescribed. You can also use insulin pumps or inhaled insulin. A pump provides a continuous delivery of rapid-acting insulin through a catheter under the skin. The constant flow delivered by the pump is called the basal rate. At mealtimes, or at other times when you want to take insulin to cover snacks or to correct blood glucose levels, you can program the pump to deliver an additional dose, called a bolus. A newer product, inhaled insulin, is a short-acting substance inhaled before meals or snacks. It eliminates injections, at least for short-acting insulin, but it’s not as precise as injections. The long-term health risks, if any, are unknown. Some people can control type 2 diabetes with a well-balanced diet and regular exercise. However, persistently high blood glucose levels probably reflect the need for pharmacological treatment. Traditionally, type 2 patients have begun treatment with an oral medication, but this has begun to change in recent years. Today, if your A1c level (a test that measures average blood glucose over the last few months) is over seven percent, your healthcare professional may actually start insulin immediately. As type 2 diabetes progresses, the pancreatic beta cells gradually lose their ability to produce insulin. Eventually, you require supplemental insulin to manage the disease. However, the speed at which diabetes progresses—that is, the rate at which beta cell function declines—depends on many factors, including your weight, genetics, diet, and activity level. It's important to stay in close contact with your healthcare professional. Feeling nervous or uncomfortable about starting insulin is very common, but these concerns should not deter you. If used properly, insulin is a life-promoting drug. If the drug makes you skittish, you should talk to your healthcare team or ask your healthcare professional for help finding a support group. Cleveland Clinic. Do You Worry About Getting Insulin Shots for Type 2 Diabetes? Published August 9, 2016. McCulloch DK. Patient Education: Diabetes Mellitus Type 2: Insulin Treatment (Beyond the Basics). Updated February 27, 2017. McCulloch DK. Patient Education: Diabetes Mellitus Type 2: Treatment (Beyond the Basics). Updated October 26, 2017. What Roles Do Antibodies Play in Diabetes?